The Juicy Couture Scottie Bling Daydreamer Bag is made from soft pink fluffy velour and features and embroidered front with crystal embellishment and the Scottie mascot logo. There is a heart on the reverse of the bag. There are two pockets on the outside of the bag and a further internal pocket. 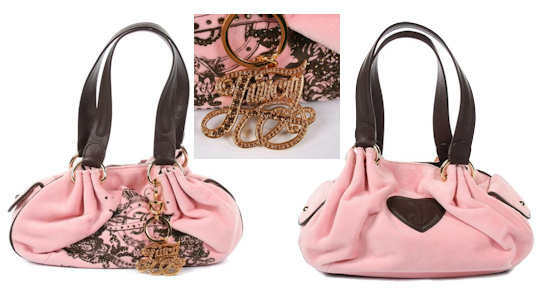 The bag has two top handle / shoulder straps and comes with a detachable golden handbag charm / key ring with the Juicy logo. Style note: This is such a cute bag, and fans of the Juicy Couture brand will find it to be an absolute must. Soft, squishy, fluffy and cuddly, this bag is the relaxed yet oh so trendy way to add a touch of Californian style to your every day life. The Juicy Couture Day Dreamer Velour Bag is a black tote bag which has a zip pocket on the front, surrounded by crystals and with a faux leather trim. The zip pull consists of a silver ring with a “J” charm and also a crystal embellished zip pull. The bag is further adorned with a handbag charm that consists of two tassels with silver hardware and a large square crystal. Other features include cinch fabric that is tied into a bow and a further crystal embellished side pocket. The bag itself has a magnetic fastening and is lined Juicy Couture branded fabric.There is a zipped pocket and and two slip pockets. Material: Velour and faux leather. Style note: This is a cute and cuddly Juicy Couture bag that would look great teamed with denim or leather, or just relaxing in your Juicy Couture track suit. 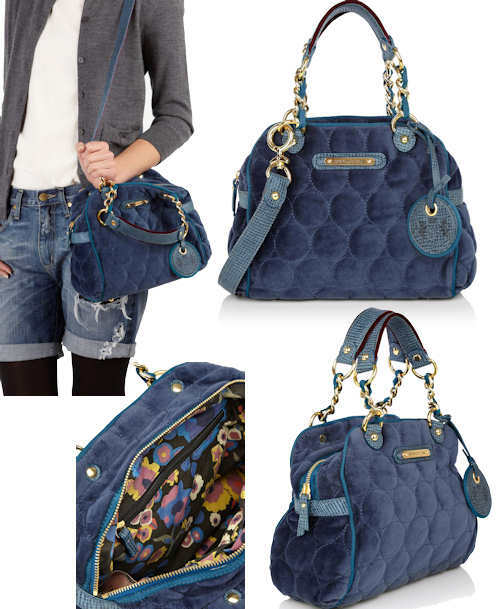 The Juicy Couture Circle Quilted Velour Bag is a tote bag which has two carry handles made from gold chain and leather, and a separate optional shoulder strap for multiple carrying options. The shoulder strap has gold lobster clasps at each end. The bag itself has a zip top fastening and there is a golden Juicy Couture plaque on the front, together with a circle handbag charm which bears the Juicy Couture logo. Inside, the bag is fully lined in a floral fabric and there is a zipped pocket and and two slip pockets. Style note: A charming bag, an absolute must for all Juicy Couture fans; it looks great with denim and the chunky golden hardware adds a dash of glam to any casual outfit. The Juicy Couture Day Dreamer Bag is a gorgeous soft bag made from embossed velour. 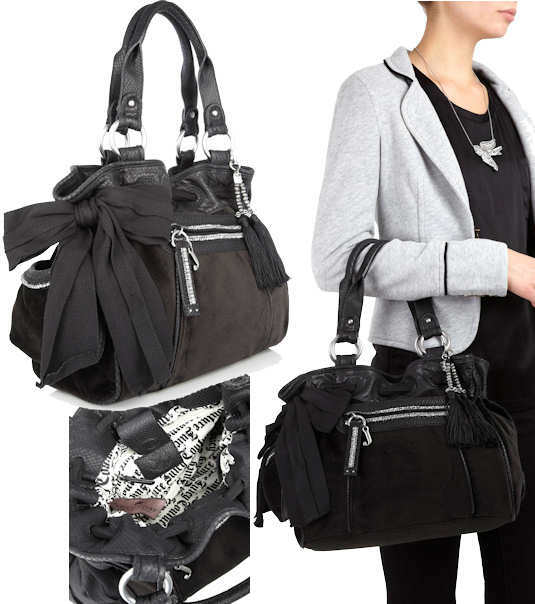 The bag has a drawstring top with bow detail and also a magnetic fastening. There is a large pocket on one side of the bag and leather handles with cut out detail that wrap around the bag. All the metal hardware on the bag is gold in colour. Inside, there are further pockets and a mirror on a leather strap, with “I am the fairest” written on the strap. Style note: This soft and cuddly bag is cute and stylish, and brings a casual Californian accent to your daytime look. 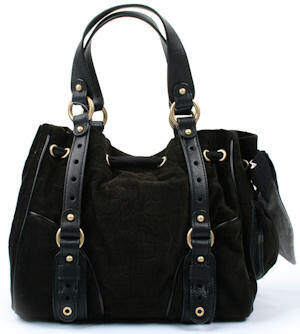 The Juicy Couture Fluffy Bag is a velour shoulder bag, available in pink or black, which is trimmed in leather. Features include a Juciy Couture embroidered crest on the front of the bag, a leather signature heart on the reverse, a flapover pocket on each side of the bag and two structured leather top handles. This bag has its own gold-tone handbag charm, which consists of a large Juicy Couture branded golden heart, together with two smaller golden hearts set with rhinestones (the black bag has clear rhinestones, the pink version has pink rhinestones) linked together by a chunky golden chain. This bag fastens with a magnetic stud fastening together with a lobster clasp leather strap. 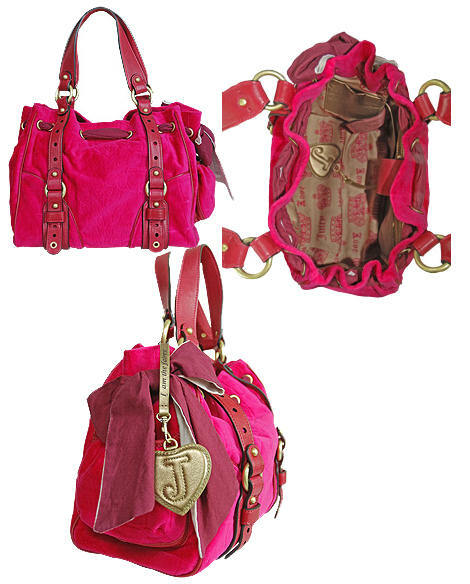 Inside, the bag is lined in Juicy Couture signature fabric and there are two pockets made from gold leather. The mobile phone pocket is embossed with the word: “Hello?”. There is also gold leather covered heart shaped handbag mirror, with large “J” in stitching, on a detachable strap (the strap is inscribed with the words: “I am the fairest”). Style note: The Juicy Couture Fluffy bag is soft and adorable and has all the features and trimmings you would expect from this brand. Designed with a relaxed lifestyle in mind, team this bag with slouchy jeans or a Juicy Couture velour tracksuit for a casual look with a Californian accent.